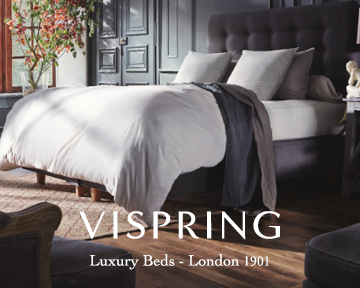 Hello, and a warm and cosy welcome! We can’t believe that we’re hurtling through November already and Shetland Wool Week 2018 took place over a month ago. It feels strange that after a year of planning, it is now over, and we’re beginning to think about the next one. But in true autumn mode, which is surely a time to slow down a little and reflect, we wanted to look back on what was another inspirational, sociable and creative festival. 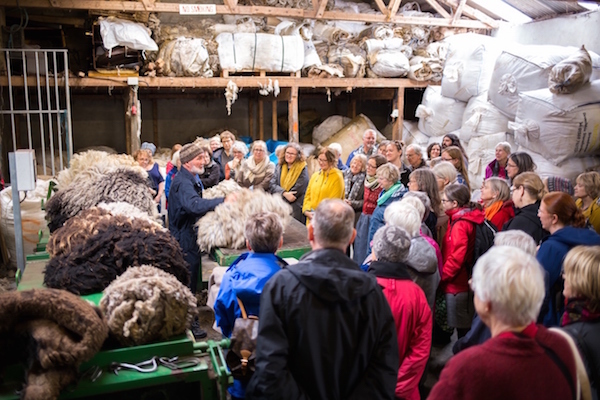 This year we welcomed almost 700 people to Shetland from near and far to take part in our ninth Shetland Wool Week. What an incredible experience it was, and we enjoyed seeing new and familiar faces. 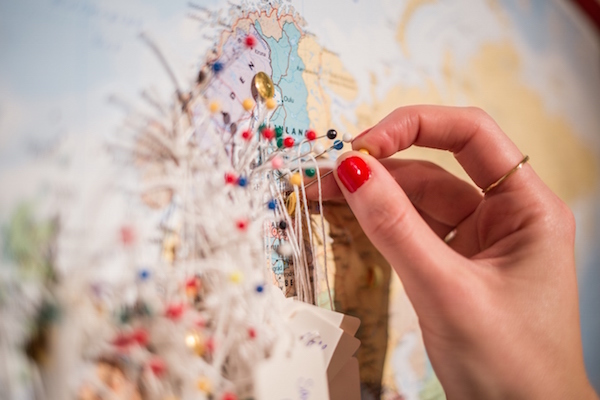 Many had taken time off their work and travelled from all corners of the world including Australia, Alaska, Hawaii and Israel. It is truly staggering when you reflect on the distances involved. For those of you familiar with SWW one of the major draws is the destination. For such a tiny place, we like to think our archipelago packs a memorable punch. 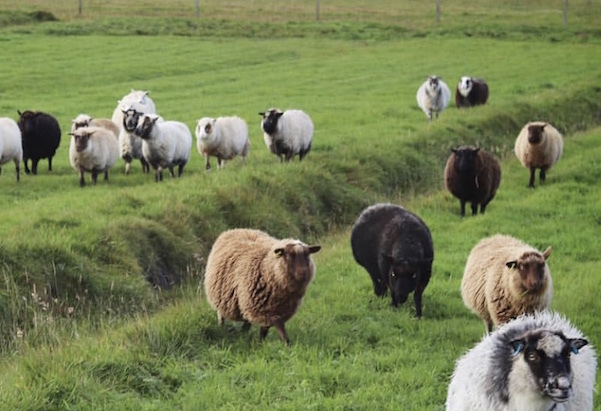 As the event has grown, and more of the local community has become involved, we really aim to make sure that there are wooly-related events throughout the islands. This year was no exception with workshops, classes, drop ins, teas and tours taking place from north to south, east to west. We have noticed that many visitors are now coming for longer, seeing it as an opportunity to learn new skills, holiday with friends, make new friends, travel, socialise, knit, spin, weave and make memories. In fact, SWW has been described by some as a ‘life affirming’ experience. As ever during SWW there was a great buzz to the place. Visitors arrived throughout the week and on different days according to their schedules. 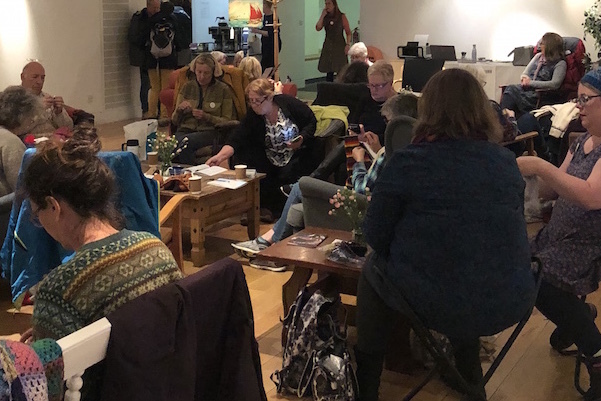 We loved welcoming everyone to the cosy Hub at the Shetland Museum and Archives – where people collected their membership bags, browsed the museum collections and displays and had the chance to familiarise themselves with the event. For first time visitors to Shetland it can be a little overwhelming to understand how things ‘work’ in Shetland. The Hub is the perfect place to speak to others and get questions or concerns answered. This year we decided to kick off the event with a more informal ‘Welcome’ than in previous years. It took place in the brand new Anderson High School. What a colourful sight it was to see so many Merrie Dancers Toories! After music by the talented Shetland fiddle group, Hjaltibonhoga, there were short speeches, including one from SWW patron Elizabeth Johnston. Everyone then got a chance to mingle, catch up with old friends, put faces to Instagram names, meet tutors, and enjoy a glass of wine and chocolate from Mirrie Dancers Chocolatiers. The sponsors were there with their teams and had put together small display tables too. 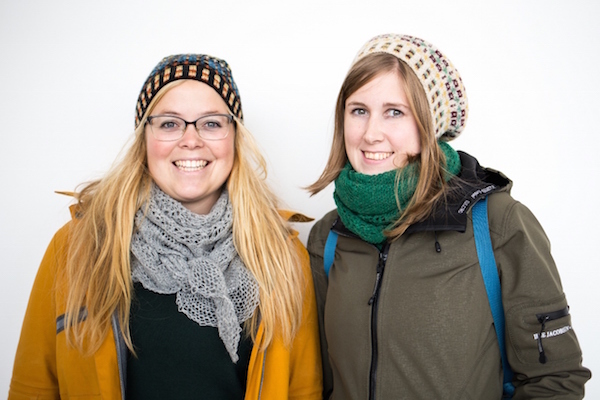 Overall it was a lovely sociable event – and also a great place to people watch and admire all the amazing knitted garments – almost a mini fashion show in itself! So much skill and talent from all over the world under one roof. Anyone familiar with the programme will know that workshops run for the nine days of the festival, and whilst we recognise that it is sometimes difficult to get hold of tickets due to the small class sizes, we hope that the breadth of events offered encouraged people to perhaps try something new. 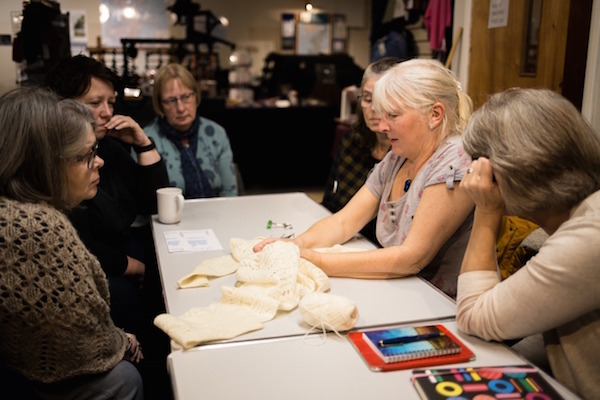 There was a diverse line up of events which included hand knitting, machine knitting, Fair Isle and lace knitting, weaving, spinning, felting, crochet, colourwork, dyeing, silver making, design, tours and talks as well as a host of free exhibitions, open studios, demonstrations and drop-in events. With a slew of over 300 events it is almost impossible to choose highlights. But we are so grateful to our tutors for putting on such a broad range of classes and generously sharing their expertise and passing on valuable knowledge and skills. 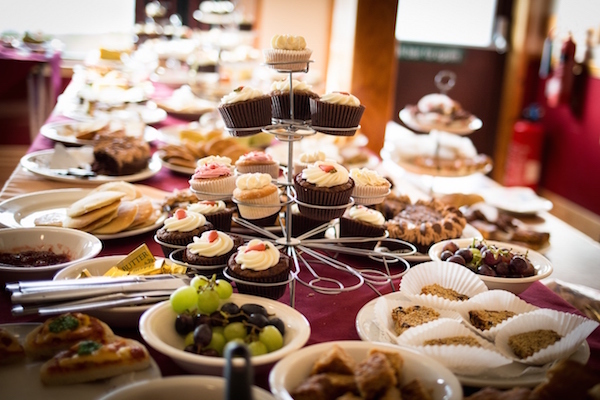 Many go the extra mile and share their personal history and bring a range of homebaked goodies to class too. We even heard of one tutor taking home a visitor’s much loved but damaged vintage Fair Isle jumper and fixing it overnight. We don’t think you can put a price on experiences like that. Our visiting tutors were very welcome too, and included Anna Vasko travelling from Finland who ran a series of natural dye classes; Dorset Button Making with Tania Ashton Jones; Thrummed Mittens with Helene Driesen, Peruvian Knitting with Frankie Owens and a range of classes from Beth Brown Reinsel; Sally Melville, Susanne Schmid, Marjolein Reichert; Tori Seierstad and Amy Detjen. Patron Elizabeth Johnson, who seems to have one of the busiest diaries we know, managed to deliver an enormous range of events and activities. As well as giving two talks throughout the week, overseeing the Hoswick Wool Week events, she also ran her own classes in spinning, knitting, lace and natural dyeing. We don’t know how she stays so calm! 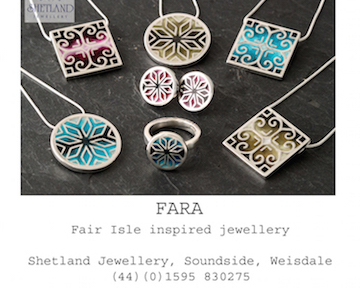 The Shetland Wool Week talks have become a key part of the programme. A particular favourite was Hazel Tindall’s illustrated talk ‘Knitting in Shetland in the 1960s’ which was based on the diary entries of her mother, Chrissie Sandison. One person commented: “Hazel’s talk was amazing. The knowledge with which she speaks about things is unparalleled and this talk was moving, inspiring and thoughtful”. From chatting with attendees and looking through the feedback it would appear that people took onboard some of our advice and chose to take a slightly slower pace throughout the week, making sure that their schedules contained enough gaps to allow plenty of time to travel out of Lerwick and make the journey to the other islands, soaking up the scenery, community museums, hospitality and events. Community halls embraced the occasion too and hosted drop ins and exhibitions with many giving knitting and lace demonstrations. The obligatory teas were also big on the agenda! No visit to Shetland Wool Week is complete without a visit to Shetland’s only commercial woollen mill, Jamieson’s of Shetland in Sandness, with a behind the scenes tour, as well as a chance to see, feel and buy their wonderful yarns and tweed. 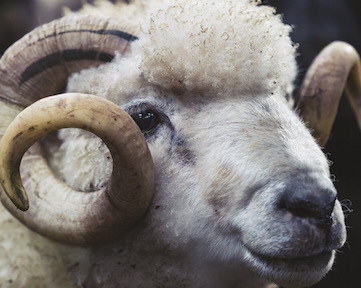 Jamieson and Smith in Lerwick is a bucket list destination too, and they opened their shop doors every day, as well as running a series of workshops and talks, including Oliver Henry’s Shetland sheep fleece sorting demonstrations. 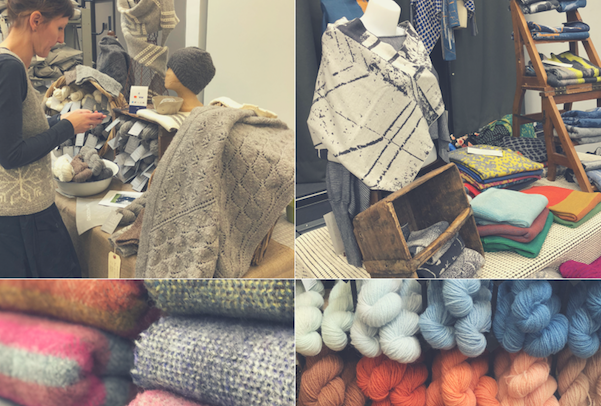 The Shetland Wool Week Makers’ Market was a highlight with a range of Shetland wool-related items, many of which are only available to buy during the week. We moved the venue to the Anderson High School which offered an airy, relaxed space, and the school put on mouthwatering refreshments too. 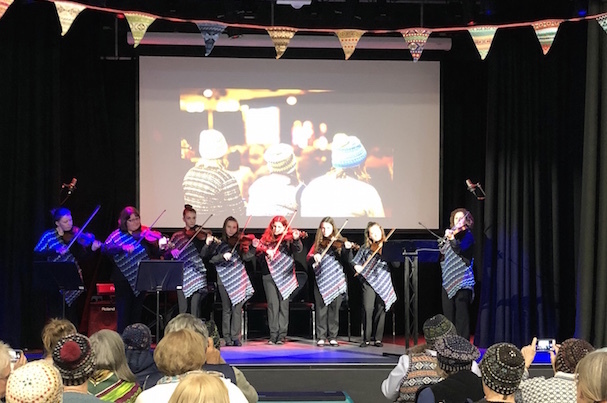 We were delighted to offer an extended range of evening events, which included a ‘Sound of Shetland’ evening, which gave a wonderful insight into Shetland’s musical history. There was also a ‘spree’ for those with enough energy to take part in traditional Shetland dancing. And Jamieson and Smith held a brilliant ‘Final Ooray’ at Gremista Farm (which is owned by a member of the Flock Book Society) with fiddlers, food and sheep. 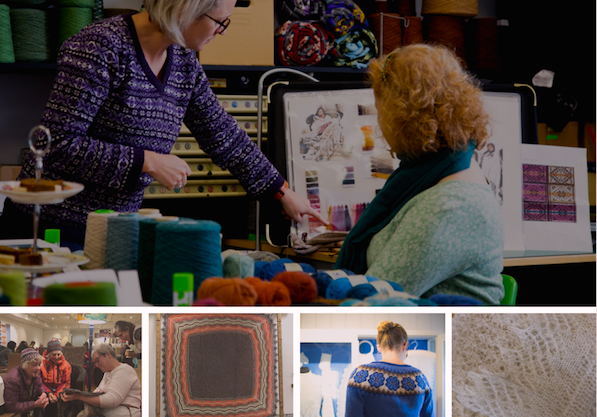 We loved every minute of Shetland Wool Week and hope you did too, whether you attended or were able to view it through following others’ virtual journeys, blogs and social media feeds. Thank you to each and every one of you for joining us. Photographic highlights can be found on our Instagram page. Promote Shetland also produced a short film which can be viewed here. Next year marks our tenth Shetland Wool Week so we’re currently busy working away on ideas on how to celebrate 10 incredible years. We hope you’ll be able to join us!